The talented Decorgal came to me a while ago with an idea for a collaborative project: A new prop hack that lets you have your sims hold multiple, custom props, plus placeable versions of these props. Decorgal handled the creation of the poses and making the hack itself, and I created the props to be used with it. UPDATE: Decorgal's post has been approved. Get the hack here. The hack lets you combine and use these props with other animations. As you can see, the sims can walk, talk, sit on the couch, do anything while holding props. 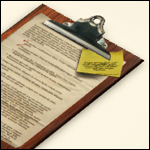 This can open up a whole world of creativity for storytellers and machinima filmmakers. 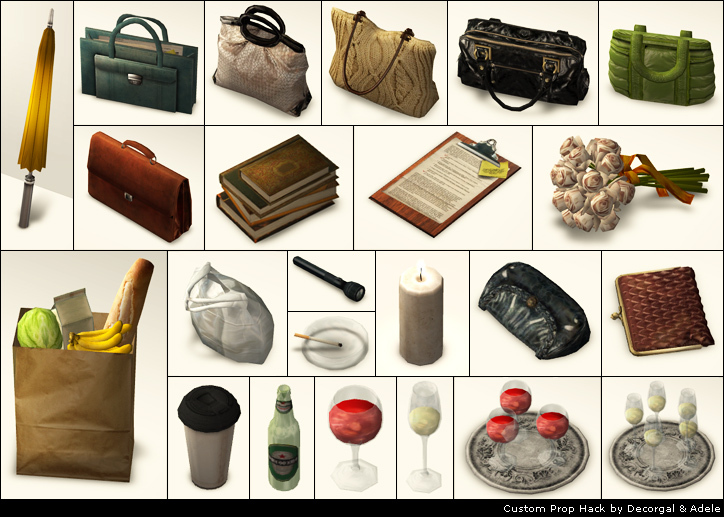 All of the accessory versions of these props (the ones the sims will actually hold in their hands) are linked to use textures from the placeable versions, and some of the placeable props share textures from other placeable props. For example, the briefcases use the paper texture from the clipboard, the wine glasses use textures from the wine trays, etc. All of this means smaller files and less work if you'd like to recolor any of them. There are 23 different props, each with multiple color options, totaling 96 altogether. Included in the rar is a collection file so you can find these more easily. NOTE: The actual hack that uses these props is a separate download. Get it here. EDIT: The third image had some weird lighting that made the guy's cigarette look misaligned-- image now updated.